When the young journalist Clara Cobián is sent to New York to record the memories of the great society lady Greta Bourvier, she doesn’t know that to fulfil her writer’s dream she will have to face once more her fascination with her old professor, Gabriel Hinestrosa, his talent for seduction and discover the real motives hidden behind the sudden return of the man who was the secret love of her life. In spite of this private anguish, Clara accepts the challenge and decides to go right to the heart of an investigation that will take her to unexpected places and situations. The story of Greta Bouvier, from her mysterious appearance in Acapulco in 1951 to her luxurious existence in modern Manhattan, is pieced together through the memories, intrigues, grievances and praise of the people who accompanied her on her long ascent to glory. But it is only Clara Cobián who has the handwritten key to resolving the enigma of Greta and her terrible secret. 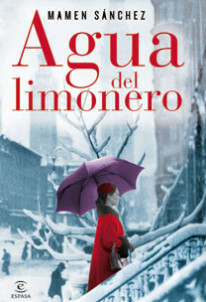 Agua del limonero is a tapestry of lives woven around the apparent success of an allpowerful aristocrat, the determination of an ambitious journalist and the nostalgia of an old story of love shattered into pieces. The portrait of an epoch reconstructed from what is left of its protagonists – a beautiful collection piece nonetheless. Mondadori (Italy), Editora Lafonte (Brazil), Bazar (Norway), Bazar (Finland), Hermes (Bulgaria).